Turning to political news…The People’s United Party will be holding a historic national leadership convention this weekend. As you know, three candidates are offering themselves for the top job of the opposition party. 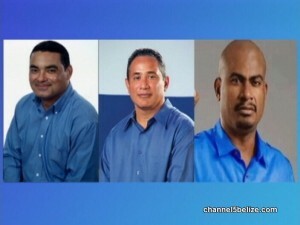 Francis Fonseca is hoping to remain as leader, John Briceño re-enters the race for the job he once held and it is Cordel Hyde’s first leadership bid. The convention to be held in Belmopan starts at nine and concludes at three. Counting of the ballots gets underway immediately after so pundits believe that the new leader will be known early. There will be no last minute speeches by the candidates; the process involves voting only by the close to three thousand delegates. It is the first time in the life of the P.U.P. and in their leadership elections that thousands are voting, the specific number of delegates is two thousand nine hundred and ninety-one. This became possible due to changes in the party’s constitution which dictates that the number of votes garnered by the P.U.P. candidates at general elections will be divided by twenty- five to determine the number of delegates per constituency, plus seven. The biggest number of delegates is from the Stann Creek West where Rodwell Ferguson received three thousand three hundred votes which means that he will be fielding one hundred and thirty-two delegates plus the additional seven. As it relates to the caucuses, the northern caucus is good for nine hundred and ninety-four delegates; overall the ten divisions in City will be fielding the least number at five hundred and ninety-five. Of that number, one hundred and thirty-two are from Lake Independence where Hyde won overwhelmingly. Briceño, Fonseca and Hyde have been around the country meeting with delegates from the thirty-one constituencies. In the last leg, the campaign has become even more negative and whosoever wins, will have to begin the work of uniting the party on Monday morning. It Is A Shame To See Commercials Saying Cordel Hyde & John Brieceno Abandoned Their People. Mr. Brieceno Stated He Had To Leave The Party For Personal & Health Reasons. Mr. Hyde’s Son Was Critically Ill & We All Knew That!!! Since When Does A Virtuous Man Ignore His Family & Health To Help Others??? They Don’t!!! Some Of You People Seem To Have Little Or No Consciousness!! How Could Members Of One’s Political Party Endorse Such Malicious Words. I Am Confused.